April 5, 2016, 10:36 AM · In an effort to promote the coverage of live violin performance, Violinist.com each week presents links to reviews of notable concerts and recitals around the world. Midori performed the Tchaikovsky with the San Diego Symphony. 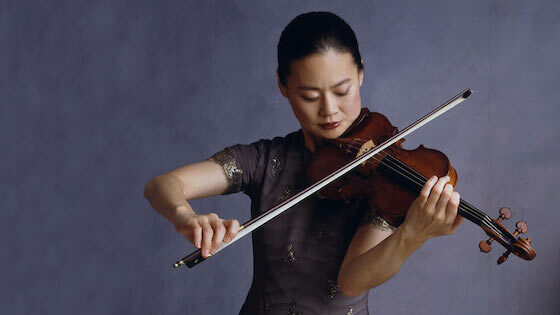 San Diego Reader: "Midori gave a jaw-dropping rendition of Tchaikovsky’s Violin Concerto." Midori Goto. Photo by Timothy Greenfield-Sanders. Gil Shaham performed Bartok's Violin Concerto No. 2 with the Chicago Symphony Orchestra. Chicago Tribune: "Standing so close to the podium that one feared he would jab Malkki with an errant bow stroke, Shaham drew from his violin a sound less cutting than lithe, a sound that could turn as exotically colored as Bartok's distillation of the Hungarian folk idiom required. Few other major fiddlers command his lightning bow arm, just the thing to ratchet up excitement in the whirling cadenza and throughout the outer movements. He and Malkki were in close accord throughout, pouncing on Bartok's abrupt contrasts between rhapsodic lyricism and pungent propulsion, to nicely dramatic effect. Backed by whistle-clean orchestral detailing, Shaham appeared to be enjoying himself immensely, and so did the audience." Chicago Classical Review: "The American violinist and Finnish conductor proved close and simpatico partners, with the restless, mobile Shaham often moving next to the podium for key solo passages as if he and Mälkki were performing a kind of vast duo writ large. Shaham’s pure, highly focused tone consistently underlined the lyrical element, treating the opening pages of the central theme and variations as a hushed reverie. Yet he also put across the bravura sections with bristling intensity, and the chromatic astringency was also manifest in Mälkki’s robust, punchy accompaniment. The contrasting sections of the finale always seem to come around one time too many but Shaham and Mälkki made the strongest case for this music, ratcheting up the tension to a blazing coda." Chicagoontheaisle.com: "While certainly his mastery of his instrument has reached even greater heights, the 45-year-old violinist still exudes the traits that quickly tagged him for success when he first appeared on the scene in the late 1980s and ‘90s. First, there is that luxuriant, inviting tone, and then the extraordinary technical facility, the sense of ease he brings to even the knottiest passages." Leila Josefowicz performed Ades' "Concentric Paths" with the Cleveland Orchestra. The Plain Dealer: "Music of the spheres it was indeed. Looping and circling each other, slipping in and out of alignment, Josefowicz and the orchestra together put on a show of swooning rhythmic virtuosity. The violinist alone was a cyclonic force. The undisputed champion of the piece (she played it here in 2010), Josefowicz sounded more comfortable with it than ever Thursday, drilling it into the minds of her listeners with the flair of a rock star and a tone that was hard but harsh, aggressive but not piercing." Simone Porter performed the Mendelssohn with the Florida Orchestra . Tampa Bay Times: "I will tell you my story, she seemed to say. It will be a story both heroic and sad, noble and poignant. And all this, through the Romantic expressiveness of her playing, she made clear in just the first musical sentences." James Ehnes performed Prokofiev's Violin Concerto No. 2 with the Indianapolis Symphony Orchestra. NUVO: "Ehnes, otherwise possessing an evenly centered tone and the chops to sail through Prokofiev's myriad perorations, seemed to be losing the "fight" to be heard above the strings in the two outer movements. He only fully displayed his quite agreeable tone in the slow movement." Pekka Kuusisto performed Mozart's Violin Concerto No. 5 with the St. Paul Chamber Orchestra. Star Tribune: "Acting as conductor and soloist Saturday, Kuusisto led performances that were vigorous and fast-paced. As a player, however, Kuusisto's Mozart style was unconvincing." Nikolaj Znaider performed the Brahms with the National Symphony Orchestra. The Washington Post: "Pumping out a huge sound on his del Gesù violin, he dominated the proceedings. I’ve heard violinists with a more ravishing tone up high, and those who put more of a personal stamp on the piece, but everything was laid out with taste and clarity. He knew when he could fool around and when he couldn’t. It was a magisterial performance, marred only in the first movement when he tried to play too fast in the cadenza and too slowly in the coda." IN OTHER NEWS: Congratulations to James Ehnes for winning his 11th Juno Award for his recording of the Franck and Strauss Sonatas with pianist Andrew Armstrong!